But I’m not giving up on this precious, important city. America shouldn’t either. I got shot in New Orleans the other day, but that won’t make me give up on this magical, essential city—and neither should you. 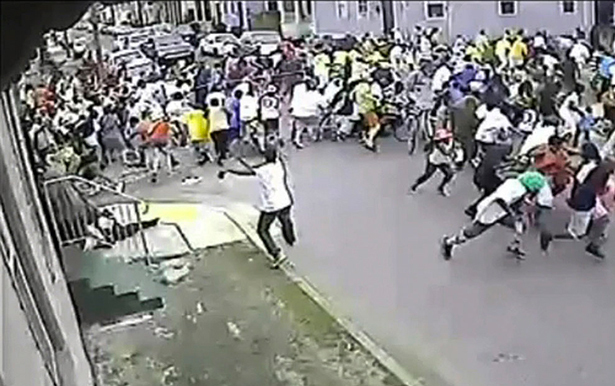 When pistol shots rang out during a Mother’s Day “second line” jazz parade through the city’s Seventh Ward, the attack made news around the world. Police said nineteen people were injured, three of them critically, in the Sunday afternoon outburst. Two of the wounded were 10-year-old children (who have now been treated and released from the hospital). As news of yet another tragedy emanates from New Orleans, outsiders may feel tempted to write the city off, once again, as a hopeless, crime-infested, hurricane-vulnerable hellhole that should be left to its own devices. But the realities of New Orleans are more complex than that—and more compelling. The truth is, the United States as a nation, and many foreign countries as well, need New Orleans to be a city that works. And that is not an impossible dream. I say this as a journalist who has grown to love New Orleans over the course of many reporting visits since Hurricane Katrina in 2005. I also say it as someone who carries a bullet in my leg from this last spasm of street violence. It’s important to understand that the second line parade is a cultural tradition dating back to New Orleans’ roots as the chief New World destination for the slave trade. Nowadays, virtually every Sunday, from September through June, one New Orleans neighborhood or another hosts a second line parade. One or more brass bands—which are composed of a dozen or so musicians who play a variety of horn and percussion instruments and are preceded by a phalanx of joyously gyrating dancers wearing brightly color-coordinated costumes—march through the streets, while crowds of people follow behind, making up the “second line” of the parade. Each second line is sponsored by a social aid and pleasure club, a civic organization established to aid disadvantaged individuals in the long years of segregation, when blacks lacked equal access to government programs and private insurance. Nowadays, second line parades function mainly as a source of community pride and celebration (as I describe in this article about a Christmas second line in the Lower Ninth Ward five years after Hurricane Katrina). The 2013 Mothers Day second line had halted momentarily at the intersection of Villiers and Frenchmen streets when I heard the “pop-pop-pop-pop-pop-pop-pop-pop” of pistol shots. Like everyone around me, I started to run, then dove to the ground. It’s a good thing I did. As the surveillance video shows, I’d have been directly in the shooter’s line of fire had I remained upright. So I ended up getting shot in the leg, rather than higher up, the way my journalistic colleague Deborah Cotton was. Cotton, who blogged for the local weekly newspaper The Gambit under the name “Big Red Cotton,” had written frequently about both second line culture and gun violence in New Orleans. I didn’t know her personally but was stricken to learn that the shooting sent her to surgery, where doctors removed one of her kidneys. She is now in guarded, stable condition, according to her editor, Kevin Allman. At a news conference Monday night, Police Superintendent Ronal Serpas named Akein Scott, 19, as the suspect seen shooting in the surveillance video. The Gambit reported that Scott had been arrested in March and charged with possession of heroin and stolen firearms, according to Orleans Parish Criminal Court records, and then released on bond in April. Scott remains at large. Dr. Prateek Adhikari, the physician who treated my gunshot wound at Tulane Medical Center, was not surprised that violence marred the Mother’s Day second line. Why should outsiders care about that mission? The unsentimental reason is economics. It is an unalterable geographic fact that New Orleans sits at the mouth of the North American continent’s largest, most economically productive river system, the Mississippi. Thus it comes as no surprise that New Orleans is America’s number-one port. Without a functioning New Orleans, America’s status as the world’s leading agricultural superpower would be in jeopardy, as farmers in the Midwest would lose their main route of export. Likewise, as much as 90 percent of the oil and natural gas consumed and exported by the United States passes through New Orleans. The Louisiana Gulf coast also accounts for roughly one-third of all seafood Americans eat. Personally, I care just as much about the unique cultural and musical treasures of New Orleans. America’s greatest contribution to world culture, jazz, was born in New Orleans, emerging from the legacy of slavery and the resulting mix of African rhythms and European musical structures. Today, New Orleans continues to boast the greatest music in America, perhaps the world, not just in the city’s countless clubs and bars but above all in the streets—in the boisterous, irresistibly infectious performances of brass bands in second line parades. To abandon New Orleans would be to abandon this precious cultural heritage, which strikes me as a sin against all that is good and right and redemptive in the world. Not only would it be unwise to give up on New Orleans, it is unnecessary. Yes, there have been many such shootings in New Orleans, and yes, serious steps must be taken to bring this deep-seated problem to heel, as Mayor Landrieu pledged Monday night. But let no one doubt that these problems can be fixed. Other American cities have suffered from apparently intractable violent crime—Washington, D.C., and New York City come to mind—but they went on to fix and transcend these problems. This article is not the place to specify which counter-strategies are best suited to New Orleans; that is a larger, more complex discussion. But as I said on CNN the day after the shootings, defeating violent crime in New Orleans will require not only the city but the United States as a whole to expend real resources, not mere rhetoric. More than one observer has said it’s a miracle that no one was killed at the Mother’s Day shooting in New Orleans. I myself am feeling lucky to be alive today. Nevertheless, I refuse to allow this deplorable incident to turn me against a city and a people that occupy such a special place in the nation’s and indeed the world’s culture and economy. And I hope that no one else falls into that trap either.